Desi ghee / Clarified Butter has been a favorite in almost all houses in the eastern countries. Since refrigeration was not that popular it was the best source of nutrition that was on top of the list among all foods because without refrigeration too it can last for months even years. Ghee is primarily composed of fats but along with that it has significant levels of vitamin A,E and D. Although many people think of of fat as an unhealthy element of the diet, but our bodies need fats to function. Omega 3s are healthy form of fats that are richly found in desi ghee which have positive health benefits on the body. But here you must note that we are talking about purely prepared desi ghee without any additive colors, fragrance or preservatives. 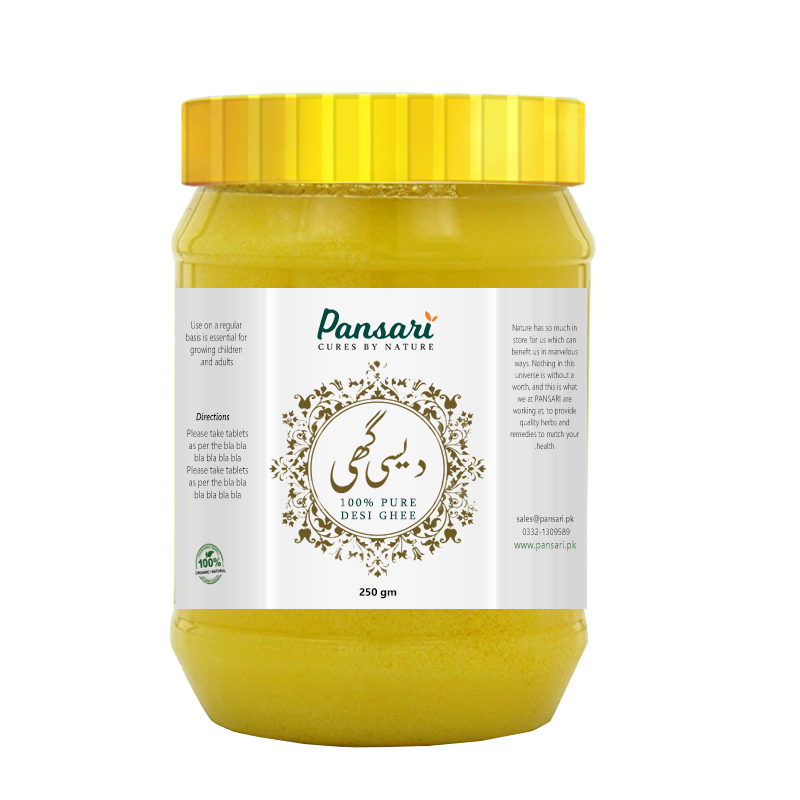 We assure you that Pansari’s Desi ghee is prepared under strict observations and is 100% pure. There are multiple benefits of desi ghee which is purely prepared. If you consume it daily it will boost your mental and physical health both. It will help your body to keep fit and will keep you away from illnesses. If you have problems with cholesterol, ghee is a healthier option than butter as it is low in fats. It is also easier to digest. If you are looking to add up some good source of fats in your meals, desi ghee will be the best option. If you look forward to have some smart babies, include desi ghee in your daily diet throughout pregnancy. Being the direct source of good cholesterol it helps boost the baby’s health and gives you complete nutrition which you highly require. Desi ghee has a high content of antioxidants. It helps in increasing the ability of absorbing the vitamins and minerals from other foods that you consume. This in turns keep your immune system strong. Ghee is rich in vitamins A, D, E and K, which are fat-soluble vitamins. They play an important role in the immune system functioning of the heart, brain, and bones. It also has loads of dietary fats that help your body absorb these essential vitamins and make use of them. Ghee is produced from clarified butter, which means that it does not contain the milk solids or other impurities that dairy products have. Casein, which is the primary protein in milk, is present in very small amounts in ghee. It is also very low in lactose content. So, if you are lactose intolerant, you do not have to worry as ghee will not cause any negative reactions. Do you know ghee benefits for skin? Ghee is one of the most popular natural remedies for the treatment of burns. It is also widely used for treating swelling in different parts of the body. Apart from this, it can also be used to reduce inflammation on the skin by applying it to the affected area. If you suffer from severe dryness, ghee can also be used as a moisturizer for your skin as well as your scalp. You can massage your skin with desi ghee specially in winters and it will give you a glowing, supple and soft skin. Ghee can help you get rid of those ugly looking dark circles. Just apply in the circular motions around your eyes and go to sleep, in no time you will get rid of them. No need to apply expensive lip balms to cure those chapped lips, just apply a little amount of ghee on your lips and there you go, you will get soft and pinker lips. It slows down the aging process wich is visible on your skin. Desi ghee benefits your eyes, yes! ancient medicinal remedies swears by ghee and its eyesight improvement properties. Eating ghee regularly can improve eyesight. If you have irritation in the eye, smear a bit of ghee under your eye. People have been using ghee for hair growth, and you can get the same benefit too. Just massage your scalp with warm ghee mixed with equal parts coconut oil. The blend nourishes your scalp and encourages hair growth. Ghee is a good remedy for those who suffer from constipation. In ancient times,ghee enemas were in quite popular. Apart from increased intake of fiber, pregnant women are often suggested to take a glass of milk every night with a teaspoon of ghee. This can ease up constipation and also boost metabolism. If you are health-conscious, ghee is a much healthier alternative to butter and many other oils that you use for cooking. Although it once had a reputation for being unhealthy, the truth about different oils and fats has been revealed by modern research. This is all about the amazing health benefits of ghee. So, we now know that ghee can be good for you as long as you keep an eye on how much you consume. You will be glad to know that ghee is a healthy fat that should definitely be a part of your kitchen!